358 pages | 18 Color Illus. | 63 B/W Illus. While the sustainability of our world is being endangered or destroyed by the misguided activities of artificial human entities, real people have begun to expand their moral sympathies sufficiently to prioritize protecting our world’s interests. They have developed a new technology—nanotechnology—that has the potential to advance human society toward a period of long-term sustainability, termed "the Sustainocene." 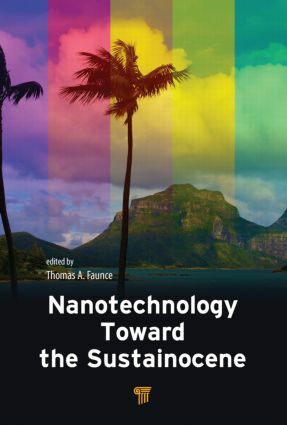 This book comprises chapters by experts in various fields of nanotechnology and in related areas of governance under the theme of how nanotechnology can assist in the creation of the Sustainocene. The book will appeal to anyone involved in nanotechnology, macromolecular science, public policy related to sustainability, renewable energy, and climate change. "This is a book designed to challenge the reader. Its goal is to lay out the scientific and technological hurdles that need to be understood and mastered if we are to reach the ‘Sustainocene’—a unique period in human history when human civilisation is in some form of dynamic equilibrium with the natural environment. The individual chapters capture important technologies that may help us get to the Sustainocene, such as solar energy, nuclear power, and nanotechnology. This book also highlights the often forgotten point that these technological breakthroughs will necessarily demand huge legal, social, and cultural shifts across the globe. We need to start the conversation now if we are to maintain our fragile hold on the only planet we have. That conversation starts with this book." "This book offers a very unique perspective on nanotechnology, and its impact on energy infrastructure of future generations. Besides discussion on the recent progress made in the nano and energy technologies, it also provides a balanced and refreshing analysis of long-term societal impact of such technologies and the potential needs for regulation. It makes a clear statement that the challenges we are facing towards a sustainable future are not just technological and scientific, but also will be economic, environmental, and social." Foreword. Nanotechnology Towards the Sustainocene. The Cosmic Context of the Millennium Development Goals: Maximum Entropy and Sustainability. Nanophotonics for Light Trapping. Growth and Characterisation of GaAs Nanowires. The Synthesis, Structure and Properties of Titania Coated Silica Nanowires. Global Health and Environmental Implications of Mimicking Biological Ion Channels Using Nanotubes. Nanostructured Materials- Implications for Information Technology. Laser Trapping of Nanoparticle Agglomerates in Air. The Bhopal Disaster and Peroxide Bombs: Nanoscale Aspects of Oscillatory Thermal Instability. Fusion Power and Nano-science Challenges for Extreme Materials. Nanotechnology, Plasma, Hydrogen From Artificial Photosynthesis and Fuel Cells: Powering the Developing World To the Sustainocene. Nanotechnology-Based Artificial Photosynthesis: Promoting Animal and Ecosystem Rights in the Sustainocene. Security Regulation of Nanotechnology Towards the Sustainocene. Thomas A. Faunce is a professor at the Australian National University (ANU), holding joint positions at the ANU College of Medicine, Biology and Environment and the ANU College of Law, and an Australian Research Council Future Fellow. He is the foremost scholar internationally working on governance issues related to the globalization of artificial photosynthesis. He has published 4 books, over 20 book chapters, and over 100 articles in refereed journals in the field of health, technology, and renewable energy governance.